In February, 2015, the entire internet world found itself spellbound by one burning question: Was the dress blue and black or white and gold? Think pieces ensued. Twitter wars erupted. Event the scientific community got involved in an attempt to settle the debate. Remember that? Well, not one to be left out of a viral cultural skirmish, Ghanaians had their own #TheDress moment on the waning of the Best Black History Month that ever was… Except for this part of the world, it was like Black Excellence in reverse. We all wanted to know: Was this bed made in Ghana? And more importantly, where could one purchase it? I first saw this image and the accompanying text on a friend’s page. I was impressed – completely skeptical about the verascity of the claims that this was a Made in Ghana item – but impressed nevertheless. Josh did not share my optimism and was quick to share his doubts. “You think it was just assembled in Kumasi?” I asked. He confirmed that the latter was most likely the case, at least in his mind. 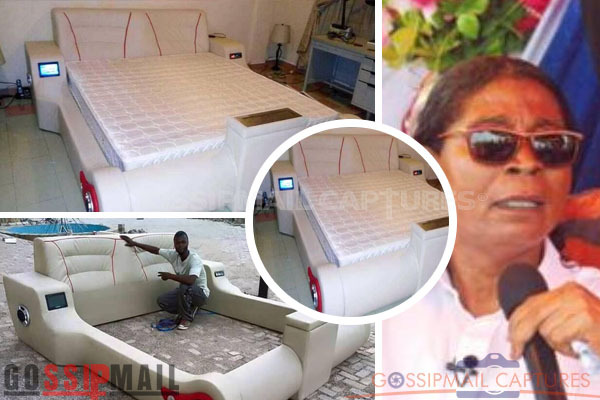 Well 5,500+ shares, 12K likes and 1600+ comments later, Ghanaians are still trying to figure out where to buy this bed – and more importantly – if it’s even possible to for our manufacturers to produce something of this apparent quality. Suddenly, the bunk bed became a symbol and a judgment of our abilities as a nation. This was immediately followed up by an admonishment to the metal workers who ply their trade on roadsides and barren wastelands by someone who has probably never built so much as a butter tin in his life. Naturally, like a shark sniffing blood, this 419 scammer came out of the woodwork and began posting the same message again and again (and again!) in reply to any query concerning where to purchase the purported Kumasi-made bed. Ironically, you could only get it in Accra. [next] Not far behind came the KNUST (Kwame Nkrumah University of Science and Technology) guys, who have blessed the country with inventions such as locally manufactured generators, car batteries and light bulbs. Let me stop lying. I don’t think a KNUST invention has ever gone to market; or at least, I’ve never heard of one. WHOEVER this company was, they must be reputable! But why wouldn’t they reveal their name? This was maddening! Right on cue, the naysayers raised their voices. Things in made in Ghana are too expensive (and they are), so it’s better we continue to import more affordable items, rather then supporting local industries. BUT! Before we can do that, we have to ascertain if this bed was made in Ghana in the first place! Why, as sister Cornelia asks, would anyone doubt that? But what is a cultural debate and self-interrogation without bringing our Naija frenemies into the foray? I don’t know what this girl was yammering about, but she was pretty passionate about. As it turns out, and as you may have suspected by now, the bed is neither made nor sold in Ghana at all. It’s available at SEARS for close to $600. Given how much interest there is in the item, any importer could pick up 4-5 of them, triple the price and make a killing in the Ghanaian market. I hope someone does. You ever hear the phrase “I just came for the comments”? I couldn’t help but come back every few days since the post was originally put up to see what people were saying next. It was like a moth being drawn to a flame or like watching a train wreck unfold before your very eyes…and just as sad. Ghanaians are so desperate for a win, to prove that we can excel at something beyond fashion and music, that we’d go to these lengths to congratulate ourselves on an item that doesn’t exist in an industry that doesn’t have the means to support its creation. The ancestors must be rolling in their graves. [next] The Kantanka Automobile Company is set to begin sales of their made in Ghana vehicles before the close of 2014. The vehicles keep attracting international attention. The British broadcasting Corporation (BBC), Agency France Press (AFP), and recently Aljazeera have all visited the country to ascertain the facts on the ground. How did it all begin? what is the current state and what does the future holds? We would walk you through the world of Kantanka Automobiles. The brain behind the Kantanka Automobiles and other Kantanka products such as airplanes, rockets, excavators, cranes etc is the African industrialist, Apostle Dr Kwadwo Safo Kantanka, famously know as the Star of Africa. Although he began the manufacturing of gadgets at an earlier time in his life, it was not until the 1970’s that he began attracting the attention of the public. As a musical enthusiast, Apostle Dr. Kwadwo Safo Kantanka started with the manufacturing of musical instruments. He then moved to the manufacturing of electronic advertising boards, voltage stabilizers, induction motors and other electronics. In 1980, Apostle Kwadwo Safo Kantanka began organising annual charity shows where he distributed food and other items to the needy in society. He also exhibited the equipment he had manufactured on such shows. Each year witnessed different arrays of machines and gadgets which he had built from local materials. The year 1996, 19th edition of the show, saw the exhibition of a locally manufactured Kantanka petrol engine block. As time passed by, different vehicle parts were also manufactured . He had alongside trained lots of Ghanaians. In 1998, Apostle Kwadwo Safo built his first ever complete-vehicle, the Kantanka saloon, a five-seater saloon car powered by the previously manufactured Kantanka petrol engine. This was how the Kantanka Automobile world began. [next] Following these inspiring initiatives, the Chartered Institute of Marketing bestowed on Apostle Kwadwo Safo a Special Award dubbed “Marketing Technological Skills through the Youth” in 1999. He also received a doctorate degree from the University of Ghana in the same year for his multi-dimensional technological acumen. After the successful manufacturing of the saloon car, the Star of Africa did not rest but continued to conduct further research. His tiring efforts yielded positive results as more Kantanka engine blocks including diesel-powered ones were successfully manufactured, tested and passed. In 2004, Apostle Dr Kwadwo Safo was appointed as an Associate Member of the Ghana Institute of Engineers. He also won the Industrial Pinnacle Award (Winner of Gold in Industrial Development Engineering) in the same year. In 2006, 8 years after the manufacture of the Kantanka Saloon, the industrialist manufactured his first ever 4-wheel drive, the Kantanka Onantefo I. Later that year, he was appointed as a Member of the National Council for Tertiary Education. The ability of Apostle Dr Kwadwo Safo to manufacture a wide range of equipment including engine blocks, a saloon car and the four-wheel drive sent powerful signals across the globe. In March 2007, when Paul D. Wolfowitz (the World Bank President at the time) visited Ghana during her 50th independence anniversary celebrations, he also visited the Apostle Safo Technology Centre. Kantanka engine. The name "Safo" and a star have being boldly scribed on the engine. On it is " K. Safo na oyoe" meaning " K. Safo made it." He was overwhelmed to see made-in-Ghana engine blocks and vehicles that were built with local materials from scratch. He also toured other products that were manufactured at the centre such as the Kantanka TVs, air conditioners, sound systems, solar tunnels etc. The state also awarded Apostle Dr Kwadwo Safo Kantanka with The Order of the Volta (Member Division) in 2007. The Kantanka Automobile Co. did not stop after the manufacturing of Kantanka Onantefo I, they released an advanced version of it, tagged Kantanka Onantefo II. In that same year (2007), they released a 26 feet long Limousine called Kantanka Obrempong I. The company also manufactured other vehicles. The list below highlights the vehicles manufactured by the company between 1998 and 2013. Kantanka Odeneho I : a two-seater electric car that does not have a combustion engine but moves with the aid of solar rechargeable batteries. The batteries can also be recharged with electricity. Kantanka Odeneho II: An updated model of Kantanka Odeneho I. It is a five-seater electric car. Like the Odeneho I, it is engineless and its powered by solar energy and electricity. 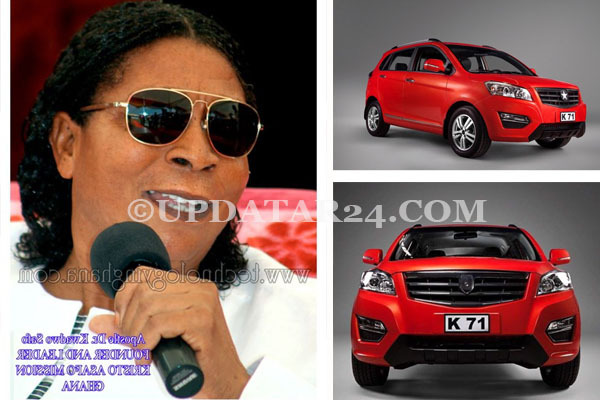 Kantanka Okunini : Another 5-seater four-wheel drive with different design and more features. Kantanka Omama: A four wheel drive that would not start if the driver is drunk or wearing bathroom sandals. It has in-built Kantanka sensors that picks these signals. The aim was to ensure that drivers obey the driving laws of the country. Kantanka Nsoromma : SUV that is powered by the Kantanka Classic Vest Ignition Technology. Kantanka Otumfuo: SUV that is powered by the Kantanka Royal Staff ignition Technology. Kantanka Obrempong II: An advance model of Kantanka Obrempong I. In addition to its in-built Kantanka CCTV to enable the driver see as far as 200m ahead and behind, it also has the features of the Kantanka Omama. For more information about these cars, click here. [next] Although the company was manufacturing vehicles, the pace was very slow. The manufacturing of the engines, chassis, and other body parts was a manual process. After this, the company had to assemble the numerous parts to obtain complete vehicles. This was once again a manual process. It therefore took almost a year to manufacture two Kantanka vehicles. The rate hindered the commercialisation of the Kantanka Automobiles greatly. To solve this challenge and increase the rate of production, the company had to find means of automating some of the processes. After years of planning, the year 2013 saw the installation of the Kantanka Assembly Plant. Following this, the company has announced that before the close of 2014, they would begin with the sale of Kantanka Automobiles. In the early part of 2014, the company began test productions of their vehicles using the Kantanka Assembly Plant. There was joy in the company when the vehicles produced passed all the vehicular tests conducted. Currently, the Chief Operating Officer of the Company who is also one of Ghana’s best pilots, Kwadwo Safo Jnr, together with other staff are touring the country with the vehicles to enable people have a feel and give them feedbacks. The test drives which began with high profiled personalities including Ghanaian celebrities have now being geared toward the general public. The feedbacks so far are great and some, after experiencing the heart satisfying test drives, have placed orders. The company would begin with the commercial production and sale of Kantanka SUVs, 2WD and 4WD Pickups. More information can be found at http://africarm.org/features-of-kantanka-cars-2576/ . Putting all together, they have 18 years experience in the manufacturing of engines ( from 1996 to 2014) and 16 years experience in the manufacturing of vehicles ( from 1998 to 2014). In addition to their long serving staff, the company also employs graduates from the various universities. They currently have about 250 staff working industriously in the various divisions and departments of the company. [next] The company in partnership with the Apostle Safo Technology Centre is also embarking on the establishment of an institution for higher technological studies to pass down their expertise to many Ghanaian ( and African) youth. The Kantanka automobiles are subjected to series of rigorous vehicular tests to ensure they are perfectly engineered, safe and comfortable. The company also make use of automated Quality Control Systems to ensure compliance with local and international standards. The company would also commercialised their saloon cars and add buses before the close of 2015. With the warm reception by the people, the awe-inspiring features of the Kantanka Automobiles and the innovative skills of the company’s founder, Apostle Dr Kwadwo Safo, there are brighter days ahead for the firm.